Kids cruising the neighbourhoods on their bikes. Today we said goodbye to our Painted lady butterflies but not after we had a chance to get up close and personal with them. We let them crawl on our fingers before we set them carefully in the Japanese lilac tree we have in our garden. Out of the 10 caterpillars we brought into our home just a few weeks earlier we have set 8 of them free. We are patiently waiting for the final 2 to hatch from their cocoon and then they will join their friends in our flower garden. I am thinking that might be a few days away from now if they both make it. Watching them test out their new wings and adjust to life outside of the safety of our nursery always brings a smile to my face and reminds me of summer. New experiences, new beginnings, new challenges. And summer insects, unplanned days, water play, so much more. I had so many plans this summer, but it’s turning out to my my home maker months! I have already started with half the masters’ bathroom. Next are the other rooms of my home. It looks to be a really busy summer! Summer has always been my favorite since I was a little kid. The pool, beach, the food, friends, all of it! Even though I don’t like summer for its weather, there many enjoyable things about it. For me, it’s the scent of freshly cut grass, the sound of crickets at night, stargazing, hiking, spelunking, yard sales, and road trips. Summer for me is fun in the sun. I live in the Midwest so our summers are very short. I try to soak up every bit of it I can. Going to the beach, backyard bbqs, s’mores, campfires, toes in the sand, driving with the windows down and the wind blowing through your hair. Summer means suntans and birthdays! My baby and my husband both have their birthdays in July, so that means a load more planning and work, but more photos for memories! Aw bye bye painted lady butterflies. To me summer is long nights beach crawling, eating out and making memories with friends. Oh my word! My kids would love this so much. I have always wanted them to see the whole process of caterpillar to butterfly! It means the kids are home from school, hurrah! It’s almost over now, less than 3 weeks! The first thing I think of is freshly cut grass, so I’m happy to see that on your list. I also love all the BBQ’ing that takes place. Summer to me means lazy days and relaxing by the pool. Often, that’s not what it is but that’s what I would like it to be. Summer, for me, is a time of BBQs, swimming, traveling, and late nights outside with my family. It is definitely one of my favorite seasons! We loved sending our butterflies off! Such a fun experience. Summer to me means relaxing and taking things at a slower pace than our buy school year allows. For us, summer means camping, and SnoBiz, and the river. I love your butterfly idea. I will have to remember this next year. 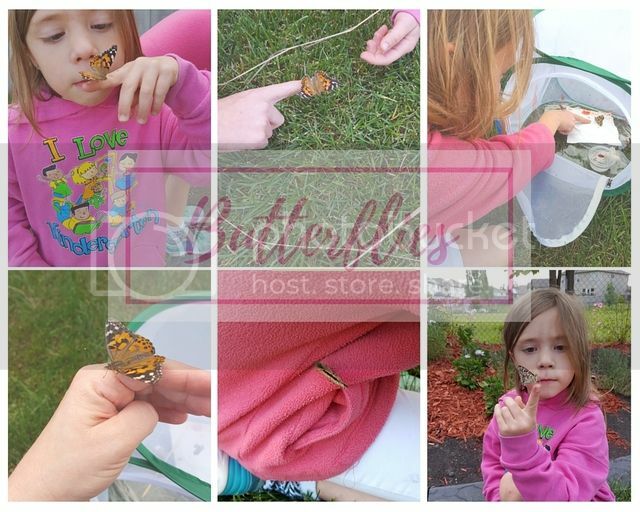 We had so much fun with our painted lady butterflies – my son got to hold them, and watch them fly away. It was really special! Lovely post! Summer for me is longer visits to the park with the dog, ice cream with the family, rides and vacations, fun and sun. Summer means time for me, time with the kids and a time to enjoy! I really like your description of summer, it reminds you of everything about your childhood! I bet it was an amazing experience to be able to play with the butterflies up close! Summer means longer days and fun nights with family and friends. It means feeling carefree for a little while and running barefoot in the grass. For me, Summer means family! My husband and daughter are out of school for the summer so lots of family outings/together time. For me, summer means cookouts, trips to the beach, rain showers, lazy days doing nothing but napping, watching and listening to birds, and reading a good book. These are all great days in the summer for me. Oh, your whole list! My kids and I were just listing out all the things we love about summer. They like to have sleepovers in the living room too. Ahhhh summer…It’s pure magic isn’t it? My little lady is SO into butterflies right now. It’s adorable! Summer means getting the kids out of the house, meeting new friends and exploring everything around us. What a great thing to think about. Sigh. at this stage in my life, summer is still just work and work unfortunately. I do try to have us do a little more on weekends but work still over powers. In my head summer is beach, food, dinner parties!! My summer memories are just like yours. The smell of freshly cut grass, the drone of lawnmowers, the smell of suntan oil (you can tell I am old), hotdogs and hamburgers on the grill. Sprinklers, children laughing, fireworks, swimming, ice cold sweet tea, BBQ, daisies, wildflowers, flip flops, lingering sunsets, fireflies. This is what summer is to me! Summer is just a time to reboot. Time to take it all in, relax and enjoy little things (like the bon fires or smores)… love it! awe, bye bye butterflies. Looks like you guys will have a fantastic summer no matter what. What a sweet memory.. I think summer means pool time, grilling, and most importantly long days spent with my family. Love what summer means to you. For me, it’s beaches, family time, cookouts, and late nights! I love that the sun goes down later.